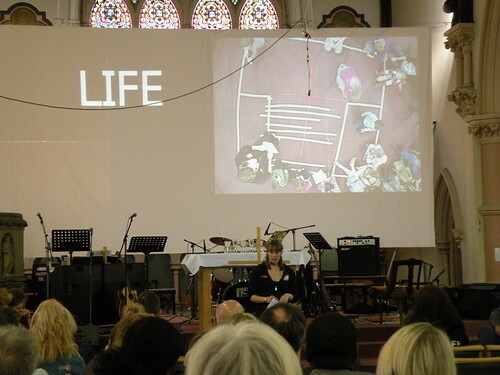 Here’s an unusual set up from our morning service yesterday. What you are looking at is a style of service we are working on a lot at the moment called ‘together’ which is designed no just to be ‘all-age’ to include children, but to get people working and interacting together during a service. Anyway, the concept is good and seems to be working but this little video trick seemed worth blogging. Above is our ‘shower curtain’ wide-screen (which is performing remarkably well on this bright autumn morning) with two projectors rear projecting two different feeds. The signal on the left is from our Easy Worship PC while the signal on the right is an overhead ‘bullet cam’ which is hanging in the middle of the photo. Then as each answer sent in appeared on the left hand screen (not shown here by the way) a line of masking tape was added to the picture on the floor to indicate if that thing would get the person from left-to-right or from us-to-god (I’m sure you know where this is heading. Then eventually a red cross was added using electrical tape (if we did this again I don’t think we would use red tape on a red carpet but I think this was because we ran out of masking tape). As you can see the kids have stayed gathered at the front although one was more concerned that the red tape hadn’t actually made it all the way to heaven… they were then given cards with the full illustration on it and sent back to their groups and everyone was asked to pray and draw where they were or where they wanted to be in this illustration of being away from God or through the cross being with God. We have used live cameras before in these services so that if close up children’s work is going on everyone else can see it. 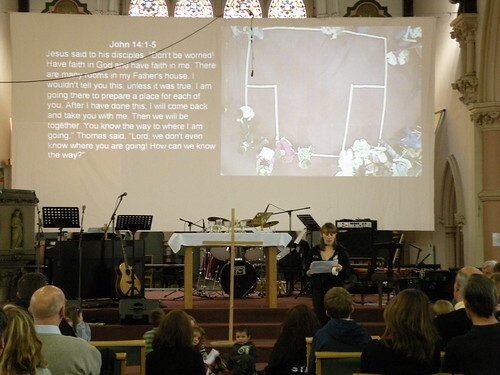 But in this case we wanted to look directly down and needed a separate feed of txt responses and teaching points while the live camera was also on – so the dual projectors were set up. Other lessons learned – we should have used the normal lens on the bullet camera but thought that the wide angle would show more floor space. A narrower lens would have meant we could have pulled the camera higher so it was less obtrusive. As always, these sorts of set-ups never go to plan and take at least twice the amount of time you thought they would. This entry was posted in case study, Christian Worship, hints and tips, how-to, ideas and tagged children's work. Bookmark the permalink.